Well, first thing you gotta know is, the Emerald Empress does appear in the latest issue of Supergirl, but the scene is not that long. It’s good, don’t get me wrong, and has a nice tease for the Legion of Super-Heroes. 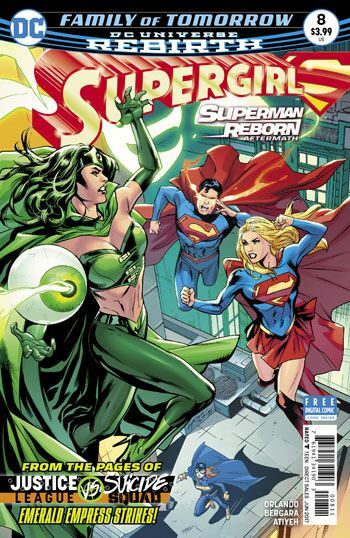 But I was expecting a full out Emerald Empress vs Supergirl story, and that is not what this issue delivers. Instead, this issue is a bit of a grab bag, pulling together a variety of different threads. Or perhaps being pulled apart by them. I enjoyed the individual scenes, and Orlando’s dialogue was always fun and crisp, but I can say this was the weakest issue of the run so far. Superman takes part in the battle with the Emerald Empress, and sticks around afterwards, as they wander through National City. I admired the way Orlando had Clark help Kara with her linguistic struggles, the proper use of contractions, which do not exist in the Kryptonian language. I also really loved that he drew on an old 70s story, about the annual day when Kryptonians must speak nothing but the truth, in honour of Val-Lor. 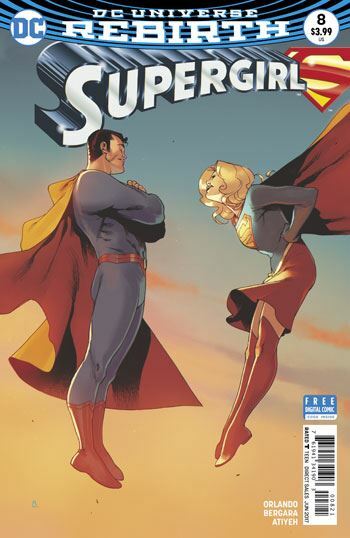 Supergirl has some bonding time with Jon Kent, and gets an explanation of the Superman: Reborn storyline. The conclusion, which features some very nice parallel work in the story and art, is largely a lead in to the next story arc, which ties in with Batgirl’s appearance in the recent annual. A little of this, and a little of that. But not quite enough of anything to make the issue stand out.